First, I know that I should be blogging about my leaf drawing. It’s just not happening right now. However, I’ve just done something more interesting. Last night I was testing a recommendation for a foot bath recipe involving Listerine: white vinegar: warm water in ratios 1:1:2. It doesn’t work very much better than the much less expensive warm water and soap foot bath. And it makes your feet blue! It was the blue feet that got me thinking. If Listerine and vinegar solution will stain skin then it might well dye a protein fibre. I just happened to have a small skein of white wool sitting nearby so out came the feet and in went the wool. It soaked overnight because I forgot about it. 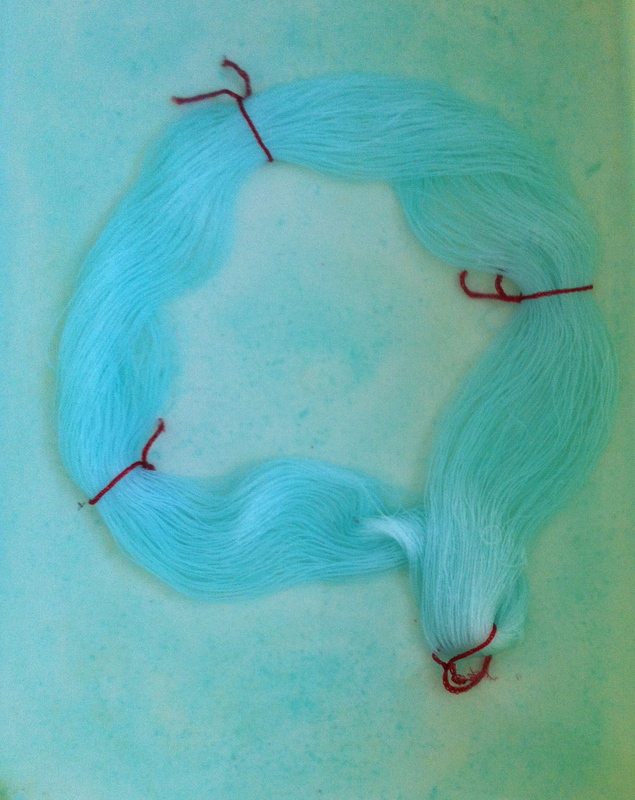 White wool skein in solution of Listerine, vinegar and warm water in ratio of 1:1:2. After removing it this morning I drained it off a bit and wrapped it in plastic wrap. I then microwaved it for two lots of one minute on high and then two lots of one minute on 50% power. Post soaking the skein is draining. After cooling, rinsing and drying, this is the result. 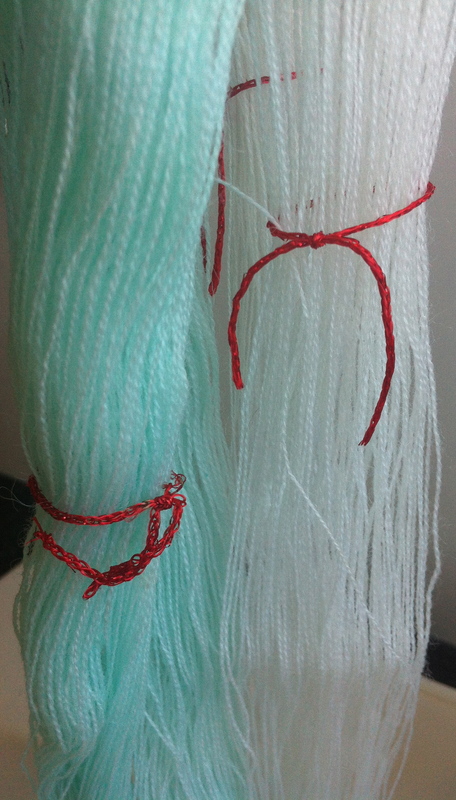 I’ve photographed it with an undyed skein of the same wool so the difference is clear. It’s a lovely soft aqua. Rinsed and dried and alongside undyed original. I reckon I might try other household products as the opportunity presents! And I might check if cellulose fibres such as cotton and banana will also dye with Listerine and vinegar. 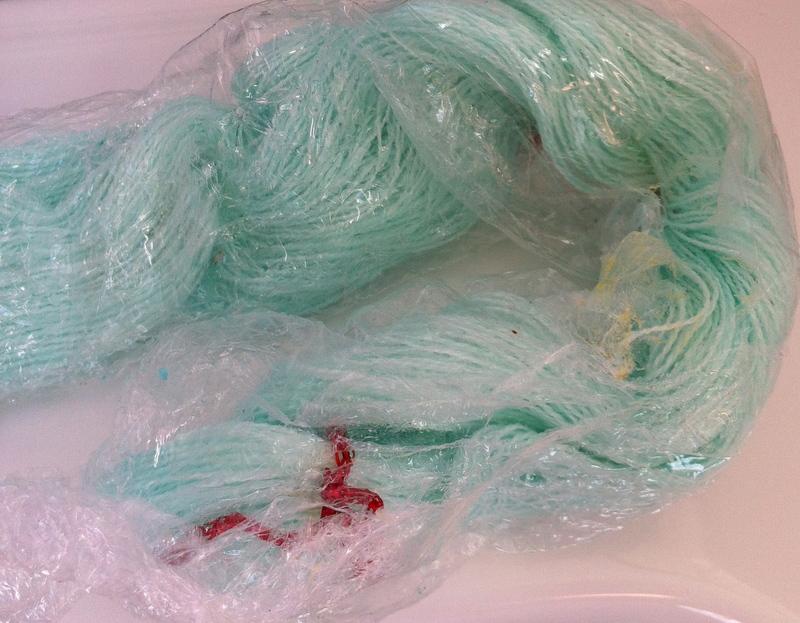 This entry was posted in Dyeing with household products. Bookmark the permalink. 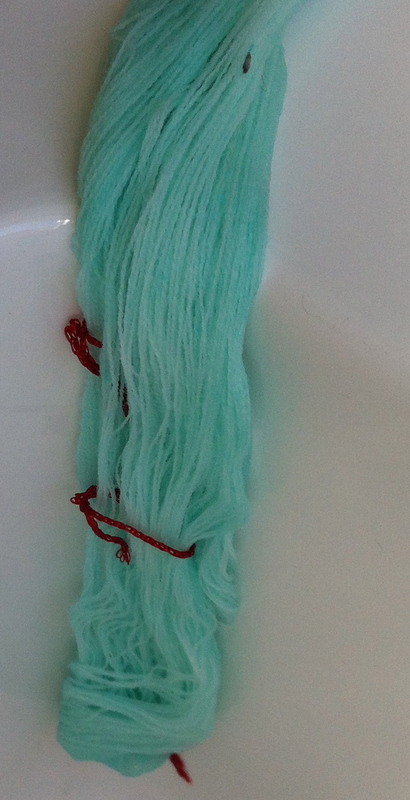 Very interesting and a far more appropriate colour for wool than your feet! What a gorgeous colour. Wonder why you haven’t got blue teeth…..
B) if anything, I’d have blue gums but only if I heat set them after I gargled!